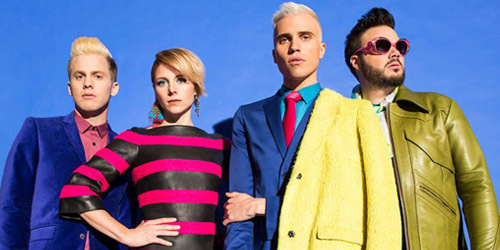 Almost six years ago, the Utah band Neon Trees signed to Mercury Records, beginning their trek onto the pop charts with smashes like “Animal”, “Everybody Talks” and their latest radio cut (and former #1 on my personal chart) “Sleeping With A Friend”. The quartet, consisting of Chris Allen, Elaine Bradley, Branden Campbell and Tyler Glenn, have been a favorite of mine since their major label debut; they also played Spring Weekend during my junior year of college in 2011. Firmly rooted in the golden age of new wave and dance, our masters students in music are now teaching a course in Pop Psychology, their third full-length album, out on Tuesday. Of course, the group’s promoted their latest release through live appearances and such, but several moves on lead singer Glenn’s part have kept their name in the press, including a now deleted rant last October in which he called out members of the band’s management and his recent coming out last month to magazine Rolling Stone. How much these actions will affect the debut week sales of Pop Psychology (which has a good chance of debuting in the top ten regardless thanks to a low sales threshold) has yet to be fully determined. Luckily, the album itself is pretty solid. I think I’ll let the music speak for itself, as we take a ride into the electronic sonic atmosphere of Neon Trees‘s latest effort. Highlights of the set include the pulsating pop opener “Love In The 21st Century”, which sets the mood with its portrayal of “broken heart technology”, a future concept of love that’s become material rather than physical. (This is also followed by the even more technologically savvy “Text Me In The Morning”, a 90’s Alternative-inspired ode to cellular crushes.) “Century” could lend itself well as a good followup to the aforementioned “Friend”, as well as fourth track “Teenager In Love”. With a power pop meets early 80’s rock vibe, much like a Greg Kihn or Tom Petty record, the glossy number takes a more negative outlook on the protagonist’s world: “He’s a teenager in love/What a tragic attraction/What’s the point of romance?” While not necessarily the darkest moment on here, it does seem to put a damper on things. Other inspired tracks include the Depeche Mode flavor of “Unavoidable”, featuring a shared lead vocal by Bradley and Glenn. The lyrical content is oversimplified to an extent (“You are the magnet/I am metallic/So do what you do to me”) but overall, it does pop in the lineup. Next to it is the more mysterious “Voices In The Hall”, a song that wouldn’t sound out-of-place mashed with Alphaville‘s “Forever Young”. The synth-driven melody mixed with the recollections from a relationship long departed ends far too soon; it’s a more minimalist side to the band that isn’t really heard elsewhere on the album, and certainly would’ve benefitted from other vulnerable moments like this. Although Pop Psychology is full of fun sounds and playful lyrics, the biggest downside to it all is that unlike some of the experiences in love detailed on here, the album suffers from material which isn’t so remarkable outside of the first listen. Now, this isn’t to say that the quartet plays it safe. They do have a comfortable zone musically, but they go outside it and generally have no huge issues. Unfortunately, songs like “I Love You (But I Hate Your Friends)” and “Foolish Behavior”, though worthy of being heard in the first place, are just not the most memorable pieces. They blend in quite easily to the Alternative musical movement at hand. Single “Sleeping With A Friend”, a lovable jam when it comes to my tastes, is also a victim of the same fate, struggling to break the top ten at the radio format. Does this mean the saturation point is near for 80’s pop on the airwaves? It could be. I hope it isn’t, but it isn’t helping these guys on a national level. At this time, both Habits and Picture Show rank as stronger records for me, but this new album from Neon Trees could always be a grower. The concept of it is loud and clear: passion and romance have their ups and downs, as judged by the sequencing on here, but all in all, it’s a matter of taking care of yourself and finding “what you deserve”, as Glenn sings on “First Things First”. However, as far as “choosing where to go” in this album’s run on the charts, it’s only a matter of time before this follows a path similar to the first few eras. All is fair in love and worn out. Listened to the album today, and your review is spot-on. Pretty good effort, but several forgettable tracks. I really like “Voices in the Halls,” but I agree that it ends way too soon! You’re waiting for the song to pick up at some point, but it never really does. When it just ends, it’s a letdown because although it’s a very good song, it should have been even better. “First Things First” is probably my favorite song on the album after “Sleeping With A Friend.” I don’t understand why they buried it on the album. I actually think it would do quite well as a future single.